I need a versatile seasoning that will enhance the flavour of my dishes. 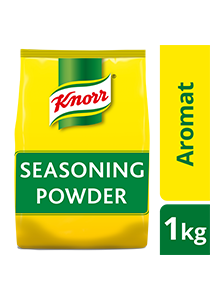 A balanced blend of quality herbs and spices, Knorr Aromat Seasoning Powder makes a great all-purpose seasoning for your dishes. An original blend of spices that enhances the natural flavour of a dish. Switzerland's favourite dry seasoning used in professional chef's kitchens.